Mix flour, salt, sugar and grains of paradise in the bowl of a food processor. Add the vanilla. Add cream cheese and butter in chunks. Pulse the machine about 8 times. Then process until a crumbly dough forms. Turn it out on your work surface and gather it into a ball. Divide in half, wrap in plastic wrap and refrigerate for 2-24 hours. In the meantime you can make your filling. Pulse all of the filling ingredients together until a thick paste is formed. When ready remove the dough half from the refrigerator and roll it out into a 12 inch circle. Spread filling over the circle all the way to the edges. Cut the cicle using a pizza cutter into 16 wedges. Starting at the large end of each wedge roll the dough towards the point. Place cookies tip point down on a baking sheet lined with parchment. Slightly curve each cookie into a crescent shape. When finished repeat with other half. Brush the tops with beaten egg and sprinkle with sugar. Bake at 350 for about 30-35 minutes or until they've turned a nice golden color. Transfer to wire racks for cooling. What is Grains of Paradise? I've never heard of it! My spice rack is sad now. Looks delicious..Whatz grains of paradise?Never heard of it.. I'm on my way to vote - good luck! I've never heard of these 'grains of paradise' either, but whatever it is, it sure makes for some scrumptious cookies. I never heard of it either, but cherry, chocolate and almond rugelach makes me smile! Oh my! This just looks incredible! Can't wait to try this! 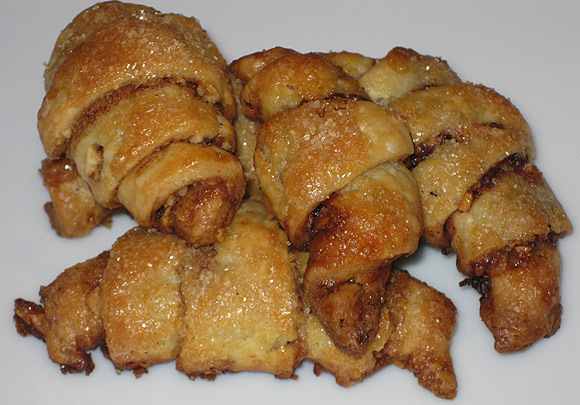 Oh those rugelach look so good! I wouldn't ahve thought to put grains of paradise in a sweet dish! But yum. They look gorgeous! I can imagine how crispy and tasty it must be ..
Oh yes...these were so tempting! I support you...how could I not? :-) Thanks for sharing with me tonight. Enjoy your weekend...take time to rest, laugh and eat some great food!